Nov. 14, 2017, © Leeham Co.: Despite the problems in the US over the Boeing trade complaint, or perhaps because of the resulting tie-up with Airbus, Bombardier has since landed two important deals for its C Series. The first was an LOI for up to 61 (31 firm 30 option) from an unidentified European operator. Based on the announced list value, these are believed to be CS100s. The latest comes from today’s Dubai Air Show from Egyptair, which announced an LOI for 24 (12+12) CS300s. Delivery dates weren’t announced. 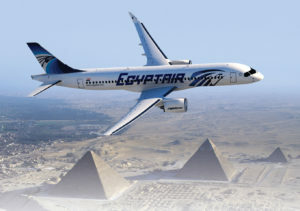 Market intelligence revealed the negotiations with Egyptair had been underway all year. Despite the financial restructuring of Bombardier last year, which led to the Boeing trade complaint this year, potential customers for the C Series remained uncertain about BBD’s long-term viability. The tie up with Airbus, which will take a 50.01% share of the C Series program, appears to have given sufficient comfort to enable two quick, sizable orders. The Unidentified order should be firmed up by year end. 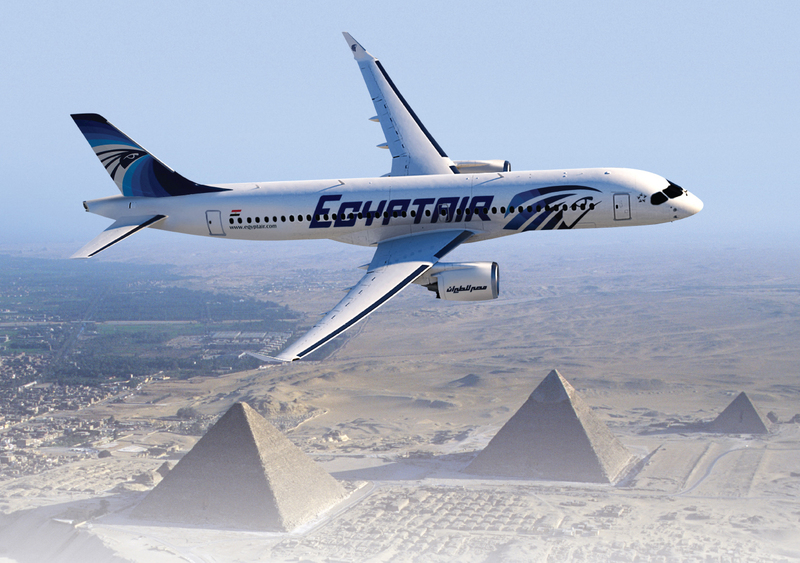 The companies did not indicate when the Egyptair LOI will be firmed up. The Unidentified customer has been speculated as the International Airline Group, Air France/KLM or Air Baltic. The latter publicly indicated plans to expand its C Series fleet, but the quantity disclosed is smaller than announced in the LOI. IAG’s British Airways has 30 Airbus A319s and one A319. Boeing announced an order for 20 737 MAXes Monday from lessor ALAFCO. Airbus today announced an order for 20 A321neos from Wataniya Airways. My understanding of the situation is that Egypt could not obtain financing to acquire A320 aircraft from Airbus and therefore turned to Bombardier to acquire similar aircraft. The problem is that Egypt is unable to pay for all the military equipment it acquired from France in recent years, including the Rafale combat aircraft. In short, as far as France is concerned, the Egyptian credit card has reached its limit. On the other hand Canada has an export programme similar to the US Exim Bank and Egypt may have been able to benefit from the financing facilities offered by Canada. Thanks Normand, I had not considered or seen anything in regard to that aspect of Egypt’s arms buying. They sure don’t give them thar fighters away. Helps if you have an aid package! I am pretty sure that this is not the case since the Egyptians continue to order and receive expensive military hardware for their Air force, Navy and Army and not just from the French. But they also must think of the pro’s and cons. The “Bank of Saud” may be hitting a “wall” on cash ai. There’s still a sizable gov budget deficit, and, worse, the war in Yemen. Well, twelve Rafales are on hold and will not be delivered until Egypt makes the required payments. In fact these rafales are not part of the original contract of 24 planes. It is an option about 12 additional rafales that french government recently refused to approve due to lack of financing. I don’t know how many Rafales Egypt has received so far. But in total they have indeed ordered 24 (12+12). What we are seing here is similar to what happens when someone has reached the limit of a credit card: all future transactions are blocked until the issue is resolved. Once again, it is just a LOI and not a firm order. If the deliveries to Delta are going to be delayed until the production line in Alabama is ready, then Bombardier will have some production slots available in the short term. A firm order now could result in getting a factory new CSeries as early as the end of next year. On the other hand, with Korean Air also pushing back the delivery of their first CS300, Bombardier will have difficulties to ramp up their production if no airline is willing to take them up just yet. Therefore, a LOI does not solve Bombardier’s problem in the short term. I could also see Lufthansa order up to 100 CS100 and CS300. They have aging A319 aircraft in their mainline fleet, and will eventually want to replace the E190 aircraft in their regional fleet as well. I see the operation with Swiss as a test run – the CSeries fits perfectly into Lufthansa’s fleet requirements. As Lufthansa’s A319s are mostly used for higher capacity flights on regional routes, it would make sense to then have everything smaller than an A320 operated by Lufthansa Cityline. The unions won’t like replacing mainline A319 with CS300s operated by Lufthansa Cityline, but that is the only way to ensure the aircraft are not moved to Eurowings altogether. Now that the CS100 is certified for London City airport, of course British Airways will want it. London City is the fastest growing market for them. Lufthansa is the only operator that could acquire on a short notice the aircraft that will have been manufactured for Delta in the event of a delay, which is very likely. The reason I say this is because I believe that Lufthansa is already responsible for the training and support of the C Series for Swiss. So everything would already be in place if Lufthansa decided to acquire the C Series for its own fleet. I think the first Delta CS100 will start to be assembled next December, that is in a only a few weeks from now. So if Bombardier cannot deliver them to Delta next Spring someone else might be interested, and I see no better prospect than Lufthansa in a situation like this. but there have been rumors the order now was from LH. Because 30 A319 are what they operate, but from the list value it’s to guess theses LOI is about Cs100. Sounds like good assessment to me as well. Not that familiar with the European situation but had followed Swiss and knew about its tie in with Luft. And as an American, its good to see an aircraft that is over 50% US content for a change (grin). 767 is what? A lot made in Japan. 777 is what? Ditto on Japan. 737 is the only one that is for sure. Regarding foreign content of various Boeing airliners, the Boeing engineers union (SPEEA) and Boeing have both stated in the past that the foreign content of the 787 is about 30%. The following quote from a 2011 Los Angeles Times story about 787 production woes cites SPEEA as stating that 787 foreign content was about 30%, that this was more than for any other Boeing made plane, and that the foreign content of the 747 at that time was about 5%. See the link after the quote for the full article. The following quote from a Boeing webpage at the link after the quote states that in 2012, the percentage of parts and assemblies purchased by Boeing from non-US suppliers was approximately 25% for all of Boeing projects and 30% for the 787. Following is a quote from a 2013 SPEEA press release protesting the reduction of domestic content requirements from 85% for certain types of Export-Import Bank financing, which states that the 787 is the first Boeing airplane with more than 30% foreign content. See the link after the quote for the full press release. Various definitions of foreign content are possible, for instance, by weight, by volume, or by purchase price. I believe that the definition that Boeing and SPEEA are using is part or sub assembly purchase price, which means that a small expensive computer would count for more than a large inexpensive airframe part. Thx for sharing various details re foreign content in 787 program. I wonder whether the ‘70%’ U.S. contents on 787 refers to airframe only or airframe+engines given that some customer deals hv separated airframe and engine negotiations. GENx is obviously U.S. content(probably @ GE N.C.) on 787 but T1000 is not(I believe either RR Derby or RR Singapore) and engines typically represent @ least upper double-digit % within total contract price paid by airlines or lessors. All I know about the US/foreign content data that I cited is what I read in the sources I cited. I don’t know whether engines are included or excluded, or any other detail of the calculations. I would guess that stacks and boxes of fuselage panels, frames, stringers, and rivets in the corner of a hangar will be considered to be of much lower value than the same panels, frames, stringers, and rivets assembled into a flightworthy fuselage. The Boeing site you reference seems to indicate the source ‘by part count’, not by value. 1. Airbus+CSeries deal won’t be finalized until 2H18. 2. Building of the CSeries FAL @ Airbus AL can’t possibly start until 1. is officially completed(Though BBD+Airbus can possibly start prelim design+planning now). 3. A new FAL typically takes @ least 1~1.5yr fm building start to 1st roll-out per commercial aerospace history. Again, I’m certain they have due to DL forced to abandon ALL of their slots(75 of those) @ Mirabel FAL. I actually think BBD must be desperate to fill the early slots fm DL with new customers because if I recall correctly(fm all those news over the last 2mths about when those tariffs become payable by DL/BBD upon importation), 1st delivery to DL was supposed to be around 2Q2018(I vaguely remember 1 media mentioned Apr18 but I could be mistaken). May be a blessing in disguise…..current delivery delay to KE and others ahead of DL would hv created a knock-on/cascade down effect to delay DL’s 1st delivery originally set for 2Q2018. BBD now hv more time/breathing room to sell Mirabel slots abandoned by DL precisely because ramp-up is delayed. But these 2 LoIs, targeted by both buyers to become firm order before Jan18, will become extremely handy when PW manage to stop messing around with PW1500G deliveries to CSeries FAL which can be as soon as mid-2018….. I see LH already doing such “test run” with 77W @ LX in prep for 779 later @ LH….a very typical German systematic approach whenever approaching new stuff. Agree. I think LH union like Cityline far more than Eurowings….for obvious reasons re employment terms & conditions. I could be wrong but I still doubt that only because W.Walsh has never been warm about the CSeries based on his comments so far about that type in IAG. Lufthansa has new 747-8 and the A380 pair, no need so far for another 400 plus seater like the 777X. They have A350-900 being delivered so could go for the 35K as well to replace the A340-600s still flying with 281-297 seats in 3+ classes. The A359 seats 293 or 319 in 2+ class. I would say for at least 5 more years, when not 10. Lufthansa refurbished what they are still using of the 747-400 fleet about 2 years ago. 1. All 748i+380 deliveries are completed a while ago and no way LH will order more for either type. 2. 744 x13 +346 x16 are still in the fleet but will retire 1st, both are almost same size as 779. 3. Some 359s are already replacing 346 thru downgauge but replacement for the remainder(my estimate is about 7) will stay more or less same gauge. *Correction: They do match exactly today….again, very German transparent mgmt style. Technically, 35K is an appropriate replacement for 346 but I think now unlikely @ LH…..unless LH suddenly decide to cancel 779 order AND willing to downgauge 744 to 35K. Actually, both 346 and 359 are in the same 3 class config consist of J+PY+Y. Only the ratios of each class differ between them. Scheduled for retirement fm LH fleet by 2025 which match their delivery schedule for 779. Will be interesting to see how LH’s plans evolve if they get exposure to Alitalia? The battle for the Italian airports could become very interesting, Qatar has made some moves, Ryanair is getting back on track, LH must have its (“war”) plan, lets see. Rome for example could become a hub for Eastern airlines connecting with the US Transatlantic. LH has been mubling that they may not want all their 779X. Sure LH could get 35K’s at good prices and pick-up early slots and push-out 779’s even further? This could be a good reason to put up a new FAL in Alabama without concluding the CS deal. Great news! I see the presence of Airbus is good guaranty for after sales for many years. Futur buyers already take note. Got something “cheeky” about it in this livery, like the 757-200 “body language”. That must be Boeings Pyramid representing its share of the C Series market segment in the far background! I like clearer pictures though. I just don’t believe how fast they painted that aircraft and got it over Egypt. At least it seems to be stirring up a storm. Theoretically these little birds should have reasonable range from hot strips. Don’t know how good the engine clearances are and the GTF’s to sand digestion tolerances. We had some steep learning curves on choppers engines sand eating capabilities. It would be interesting to have Bjorn weigh in. I don’t know that a GTF is more or less issue prone in sand. Helicopters tend to be in it all the time. And sand issue country by country? I know Iraq is noted for it, some in Egypt but not a lot of data even with WWII reading. Allegiant Air operates 39 MD-80 aircraft, but are converting to A-319/A-320 and leasing additional A-320 aircraft. I agree that the C-series would also be a good fit for them. Does not seem so, they are giving up the Hawaii run as too costly for the return. 1. A totally diff magnitude 752 vs 321Ceo in terms of op cost. 2. Mkt price for very old, used 321Ceo is increasingly approaching 752 level. 3. 752 has no maintenance+crew commonality with anything in Allegiant fleet. 321Ceo obviously has. Agree. Allegiant don’t adopt a new type wholesale(752 for Hawaii was a tiny+cheap experiment for them) unless being ‘forced to’ such as when M80 became increasingly costly to maintain…. The CSeries don’t fit Allegiant current business model. Fleet utilization is rather low, and they don’t buy new (thus saving on capital expenditure). The CSeries (and higher utilization) would be a departure from their current practice. Only 320Ceo(Not Neos) family which is technically not comparable with the state-of-the-art CSeries and industry analysts widely suspected Airbus had some end-of-line 320Ceo slots to fill @ very very keen pricing for Allegiant. Makes strategic sense for Airbus to ‘invest’ in Allegiant that way because this is 1 of the most profitable+fastest growing carrier in the U.S. and a WallStreet darling…..Airbus basically want another JetBlue as a loyal 320 customer….especially when VAm is now pretty much a lost cause for further 320 family sales thx to its new ‘Eskimo’ boss…. Most importantly, Allegiant has never stopped hunting for used 320Ceo @ cheap prices even after new deliveries straight fm Airbus.